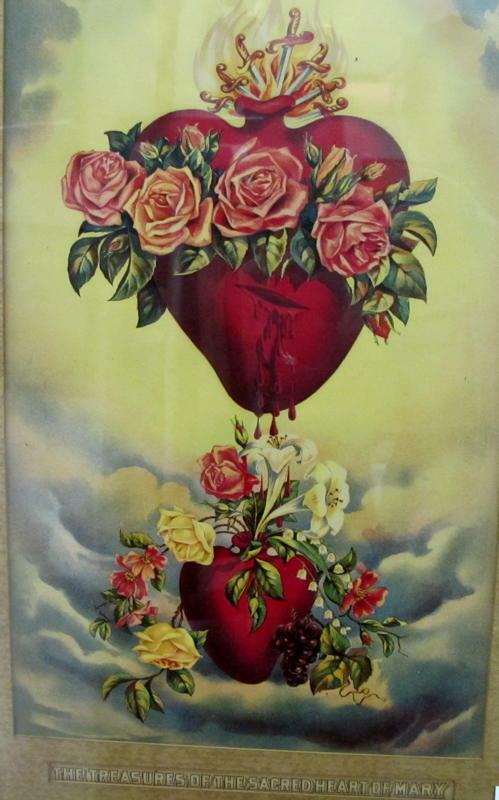 A friend Asked: Heart… why is it so prominent in symbols in Catholic faith? Heart getting burned in fire… i can remember one of the scenes in Mr. Gibson’s film Apocalypto. An old ritual for the sun god. Sacred heart of Jesus Reminds us of that kind of Love, it is not any phony love story that you hear on the sideways and highways, it’s profound, true and eternal. Amen for the Glory of His Love! The sacred of Jesus reminds me of the enormous love that Jesus has for humanity. It is not shallow but profound and without strings attached. What a wonderful Love for us fragile beings! THESE TWO HEARTS WILL CELEBRATE WITH TRIUMPH…LOVE will PREVAIL. The two times I have seen Jesus, years ago after doing a novena of prayers directed at Him; I saw only His pierced enormously large heart radiating vermilion blue, purple and green rays in all directions; His much smaller face radiating gold and white rays from his Third Eye; a face and auburn hair like painted a million times; and His extended left hand with wounds in the wrist towards me. And He rayed my own Third Eye and Heart. Afterwards I noticed that for some period, I felt him in both places when in deep prayers, or whenever something terrible was happening in the world. Or when looking at the suffering of a person. I have only one vision of Mariah (?) as a diaphanous enormously tall blue column. Looking like a thin veil dress, moving in the wind. Also coming after doing a novena of Mariah’s Annunciation and Magnificat. After that, no more visions of them, only a sense of presence and Jesus holding my left hand like a burning fire and Mariah my right hand like a soothing warm glow, when in High Mass on the Day of Palms and Easter, or in very intense praying. Of ADAM I only dreamed once, looking at and seeing only His thigh, like a toddler would see his father’s. A beautiful muscular thigh, like Leonardo da Vinci might have painted muscle studies, with the muscles outlined and softly glowing in the same vermilion blue and green and purple as Jesus. I want to paint them in the future. Have to learn to paint first. the colors of the rays in the painting must have meaning too. 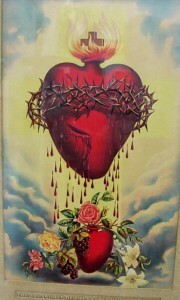 fine description about sacret heart of Jesus n Immaculate Heart of Mary.i like it.thanks for the information. I asked Jesus or God if I could have a small miracle and see the Jesus on the cross I have move, and this morning His head was straight, and moved to the right, and tilted slightly forward. As I was walking past I also noticed the sun through the window was clearly in the shape of a burning heart from every angle. (It clearly was a heart and not just a trick of the sunlight.) I can’t remember why I asked for the cross to move now, and was wondering if you know what seeing His heart burning on the cross specifically means? Thanks for your time. Sincerely. Excellent analysis Steve. Although this a perfect example of the disconnect between what the Church teaches and what people (especially Catholics) perceive and believe. You gave a beautiful explanation for the images and how they directly relate to the suffering of Christ and Redemption of man. But I could also see the Sacred Heart of Jesus serving as spooky heavy metal album cover. Kids would just think all the blood and fire looks “cool” and rebellious. The times we live in. That was very nice, Steve. Thank you. 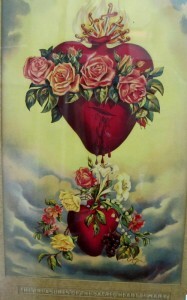 I have a very old hand painted Sacred Heart that I Placed in the very middle of my various religious art work wall. I read somewhere that if you do hand the Sacred Heart Icon, it should be placed in a very prominent place and not anywhere that it may appear to a disadvantage or inferior to anything else. God bless!